A new study by a team of earthquake scientists (seismologists) in Italy has made a signal contribution to our understanding of wind turbine noise & vibration and, by extension, Wind Turbine Syndrome (WTS). Before examining their research, however, we need to put it in context—the context of Wind Turbine Syndrome (WTS) and the central role played by the utricle and saccule in triggering WTS. 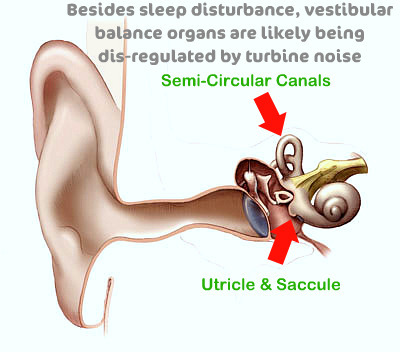 Those of you who’ve read Pierpont’s book, “Wind Turbine Syndrome,” are already familiar with the “vestibular organ story”: that the utricle and saccule (vestibular organs in the inner ear) evolved over millions of years to detect ground-borne (substrate-borne) low frequency vibration. The eyes—to see. The nose—to smell. And the ear—to hear (via the cochlea) and detect low frequency vibration (via vestibular organs). Indeed, as you learned from her book, the utricle and saccule are the low frequency vibration detectors for a host of creatures, in fish all the way up through mammalians—including yours truly. Secondly, we already know from human experimentation (Todd et al. 2009) that the utricle or saccule of the human is 15dB more sensitive to 100 Hz substrate-borne vibration than the cochlea. In other words, when incoming noise is so quiet you can’t hear it, the utricle and saccule still pick it up. Such is their phenomenal sensitivity! Moreover, we know there is definitely an infrasonic (low frequency) range of sensitivity in the utricle and saccule, although, at this point, it’s unclear what exactly the range of these frequencies is. In other words, the amount of vibration/bone-conducted sound was so small that the subjects could not hear it, yet the vestibular parts of their inner ears still responded to the vibration and transmitted signals into the balance and motion networks in the brain, resulting in specific types of eye muscle activation (eye muscle activation is a well-known marker for vestibular stimulation). 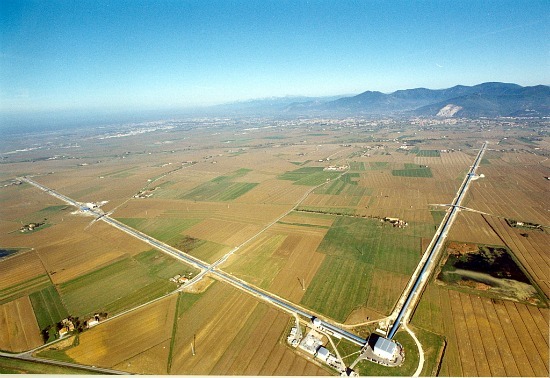 We present analyses of the noise wave field in the vicinity of Virgo, the Italian–French gravitational wave observatory located close to Pisa, Italy, with special reference to the vibrations induced by a nearby wind farm. The spectral contribution of the wind turbines is investigated using (1) onsite measurements, (2) correlation of spectral amplitudes with wind speed, (3) directional properties determined via multichannel measurements, and (4) attenuation of signal amplitude with distance. Among the different spectral peaks thus discriminated, the one at frequency 1.7 Hz is associated with the greatest power, and under particular conditions it can be observed at distances as large as 11 km [6.8 mi] from the wind farm. The spatial decay of amplitudes exhibits a complicated pattern which we interpret in terms of the combination of direct surface waves and body waves refracted at a deep (≈800m = half a mile) interface between the Plio-Pleistocenic marine, fluvial, and lacustrine sediments and the Miocene carbonate basement. We develop a model for wave attenuation that allows determining the amplitude of the radiation from individual turbines, which is estimated on the order of 300-400 µms-1/√Hz for wind speeds over the 8–14 m/s range. By In mid 2008, a wind park composed by of four, 2MW turbines was installed at some 6km east of VIRGO’s NE. After then subsequently, plans were submitted to local authorities for (i) adding three additional turbines to the existing wind park, and (ii) installing a new, 7-turbine wind park at a site located about 5km west of VIRGO’s WE. As a consequence, EGO (the European Gravitational Observatory) asked the Italian Istituto Nazionale di Geofisica e Vulcanologia (INGV hereinafter) to conduct a noise study aiming aimed at (i) verifying properties and intensity of the vibrations produced by the present aerogenerators wind turbines, with the ultimate goal of (ii) assessing the possible impact of the project wind parks. In this work, we present the results from 81 seismic noise analyses in the vicinity of VIRGO, with special reference to the action of the wind park. The paper is structured into four parts. In the first part (Sections 2-3), we describe the geological setting of the study area and describe the data acquisition procedures. We then describe (Section 4) the spectral characteristics of the noise wavefield, and their relationships with human activities human-generated noise and the wind field. In the third part (Sections 5 and 6), we use small- and large-aperture array deployments to investigate the directional properties of the noise wavefield and its amplitude decay with distance from the windfarm. In the last part (Section 7) we propose an attenuation model involving the combination of direct cylindrical waves propagating at the surface, and body waves refracted at a deep (800m half a mile) lithological rock interface. This attenuation law is eventually used for establishing a predictive relationship for assessing the range of seismic amplitudes which are expected in association with narrow-band, shallow sources of noise. Several out of the frequency peaks, which correlate well with wind speed (e.g., 1.7, 3.5, 4.5 Hz on the NS component), attenuate as one goes farther from the wind park, thus reinforcing the hypothesis that these peaks are due to the action of the turbines. In particular, the peak at frequency 1.7 Hz is clearly observed also at VIRGO’s WE, about 11km 6.8mi from the wind energy plant. For this particular frequency, the decay of spectral amplitude with increasing distance from the source exhibits a complicated pattern (Fig. 8b). In particular, we observe a marked change in the amplitude decay rate for source-to-receiver distances on the order of 2500-3000m 1.6mi-1.9mi. A simplified propagation model explaining the two different attenuation rates involves the combination of direct surface waves and plus body waves propagating along deeper paths, characterised by higher velocities and quality factors. In this paper we analysed the seismic noise wavefield in the vicinity of the VIRGO gravitational wave observatory (Cascina, Pisa—Italy), with special reference to the action of a nearby wind park composed by four, 2 MW turbines. Using stations deployed at distances ranging between  1200m and  11,000m 6.8mi from the barycenter center of the wind park, we obtained recordings of the noise wavefield over a wide range of site conditions and epicentral ranges. We noted that path effects modify significantly the source spectrum, implying that beneath-turbine measurements measurements taken directly beneath the turbine blades are not fully indicative of the effective contribution of the wind park to the far–field ground vibration spectra. Therefore, the spectral components of the noise wavefield likely due to the action of the wind park had to be discriminated calculated on the basis of indirect evidence, including: (i) correlation of narrow-band noise amplitude with wind speed, (ii) directional properties, and (iii) attenuation with increasing distance from the wind park. Basing Based on these results, we individuated distinguished several frequency bands likely due to the action of the wind park. Among these, the most energetic is that at a frequency of 1.7 Hz which, under particular conditions (i.e., low cultural noise man-made noise and strong wind) can be clearly observed at epicentral distances from the turbine array as large as 11km 6.8mi. At this particular frequency, the waves depict demonstrate a complicated pattern of attenuation with distance, characterised by a marked decrease in the decay rate for ranges larger than 2500–3000m 1.6-1.9mi. We interpreted this pattern in terms of a simplified propagation model involving the combination of direct, cylindrical waves and body head waves continuosly refracted at a deep (800 m half a mile) interface separating the shallow marine-lacustrine lake sediments from the carbonate basement. This model is based on several simplifying assumptions, including: (i) seismic energy is equally parted divided into surface and head body waves, and no other wave types and/or wave conversions are allowed, and (ii) site effects are negligible. By further assuming that (i) each turbine radiates the same amount of energy; (ii) signals from individual turbines sum add constructively, (iii) the velocity structure of the propagation medium is laterally homogeneous, and (iv) local amplification effects are negligible, we thus defined a model relating the seismic amplitude recorded at a given distance to the radiation of each individual turbine. Léna Cauchie is at the UCD School of Geological Sciences, University College Dublin, Belfield, Dublin 4, Ireland. lena.cauchie@gmail.com. Also at Istituto Nazionale di Geofisica e Vulcanologia, Pisa, Italy. Click here for the full article, Bulletin of the Seismological Society of America, April 2011, v. 101, no. 2, p. 568-578. The studies by seismologists are of the utmost importance. Most investigations of infrasound have focused on low frequency pressure waves transmitted by air. Frequencies below 20 Hz, however, are very efficiently transmitted through rock, soil and building foundations. Much covering-up and obfuscation has occurred, evidently encouraged by the wind turbine industry. Evidence of dangerous effects on health by infrasound transmitted not by the ears, but by the body, goes back a long way, and there is much solid data pointing to serious effects on health. Just by way of amusement, look through the history of the great Nicola Tesla. He had great fun playing with vibrating platforms. He claimed to be invigourated by standing on his infrasound platform for one minute. A few assistants, however, made the mistake of standing on his vibrating platform for longer times. The effects were deadly, with elevated heart rate and confusion lasting for hours. I do have an interest as an inventor of a new non-vibrating turbine, but the facts are there to be found and I submit that I am being objective in sounding a grave warning about current wind turbines. Although a bit off point, an interesting aside: I was recently told that two local television stations, using doppler weather radar, were repeatedly picking up a micro-storm pattern, always at the same map location, regardless of weather conditions. And yes, oddly enough, a single, private business turbine is situated at their remote location . . . I live in Canberra ACT Australia where wind farms are being built at an alarming rate in the surrounding areas which are predominantly agricultural. A new wind farm was recently commissioned by Spanish company Acciona at Gunning about 100km north-west of Canberra and it now is clearly visible (whenever the blades are rotating) as a micro rain event on the area government Bureau of Meteorology internet weather doppler radar which scans from south of Canberra, 150kms from where the wind farm is to the north. No one “wants to know about it” and the mainstream media, which is very pro-renewable energy (Australia is intoducing a “carbon” tax of $23 per tonne of carbon dioxide emitted), will not report it. I am not a scientist but I used to be a private pilot, so I have studied weather patterns, IFR etc. I am concerned that these wind farms clusters that are so large that they can simulate storm clouds on weather radars, are also capable of more sinister things such as sesimic activity and EMR emissions that will interfere with air navagation aids etc. Not enough research has been carried out into long-term effects. All it needs is one successful legal action against them and the whole industry will be “up in the air” (forgive the pun).